We humans have been transforming spaces on earth for thousands of years. Even without modern technology, our ancestors created amazing structures that continue to stand today. Take a trip back in time and marvel at engineering feats (and calamities) in the Wonder Museum! Why Is the Statue Of Liberty Green? Is the Leaning Tower of Pisa Falling? Get ready to explore these historical Wonders. Get ready to rumble with this Maker! First build your shake table: Take the two pieces of cardboard and wrap the rubber bands around them. Then place the tennis balls in between the cardboard. Make a "sandwich" with the cardboard being the bread and the tennis balls being the "meat." Next, tape the paint stirrer underneath the top piece of cardboard. This will be your handle to shake you table. Now it's time to build your structure. Take some time to sketch your idea first, on paper or in your Wonder Journal. The manilla folder will be your base. Use the coffee stirrers and clay to build your structure. Measure your structure to make sure it is at least 6 inches tall. When your structure is ready, attach it to the top of your shake table using your binder clips. Steady the bottom of your shake table with one hand and use the other hand to move the paint stick handle back and forth. How did your structure do the first time? What did you change that made your structure more sturdy (hint: make triangles or squares - which shape holds up better?) Is a wider or narrower base better? An earthquake is caused by the slipping of pieces of the earth's crust, which creates rumblings and vibrations through the ground. These vibrations can easily topple otherwise solid buildings. By keeping buildings light and flexible, they are able to absorb the shock and distribute the energy caused by the earthquake. 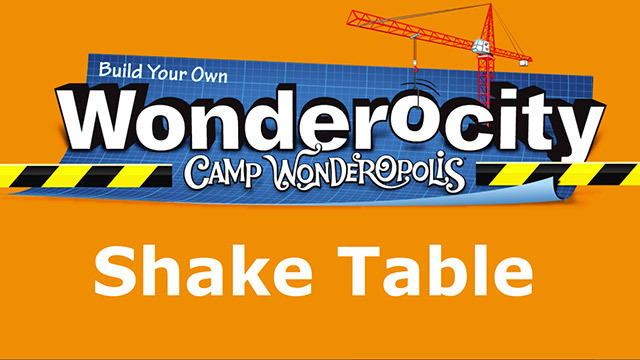 How tall could you build your structure and still have it survive the shake table? What other items could you build your structure with? These reading lists were provided by Taylor County Public Library in Campbellsville, Kentucky.